Well, it’s been an insanely busy time here at artgoodies with lots of exciting things in the works! I’ve been working extra hard and so July’s color of the month is simple and calm. A simple vignette this month. 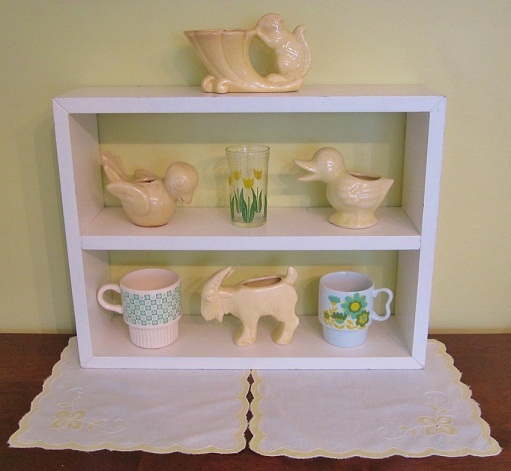 Featuring some darling pottery, a couple cute mugs, a swanky swig, and 2 adorable napkins anchoring it. The goat planter is a very hard to find stretch McCoy. 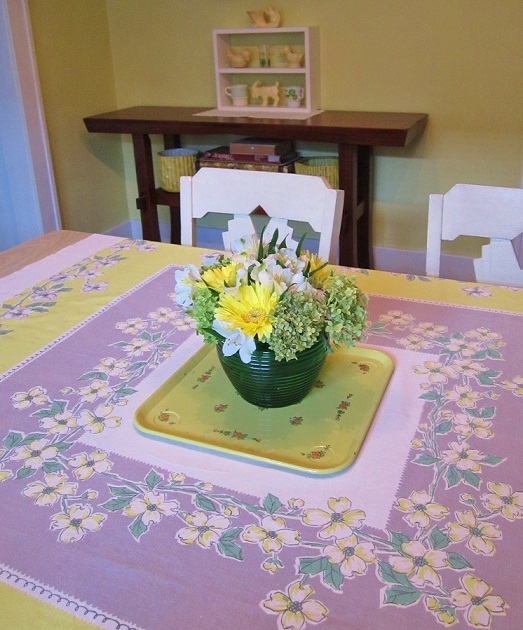 This is one of my favorite vintage tablecloths, and the flowers in the vintage green planter and tray aren't too shabby either! I’ve always loved to garden. I find it therapeutic and peaceful. Watching things grow and change whether it’s a flower or a veggie plant makes me happy. I just had a magazine photo shoot at my house so it was a super motivator to get my gardens back up to snuff. This was quite a challenge with the heat we’ve been having so I had to call in a super friend, aka garden ninja, for reinforcement and water like crazy. I thought I’d give you a little garden tour through the side gate. This little area was in need of some mega help. 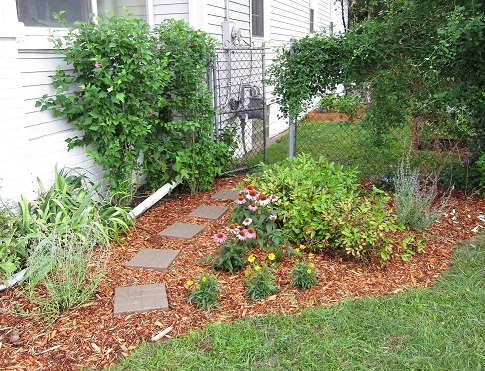 So some little plants friends, paving stones, and mulch came to the rescue. I'm pretty sure the meter man will be happy he has a path! 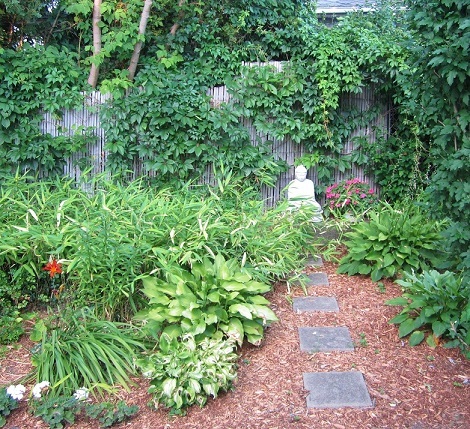 Here's my little side yard. 3 veggie gardens take up the space, one new this year! Lots to harvest in this little space. Some new plants in the back corner add some extra plant awesomeness too! Hello Buddah, relaxing on a cement step that houses some kind of manhole for who knows what back in the day, makes a perfect stage for my zen friend! The more traditional side of my garden. 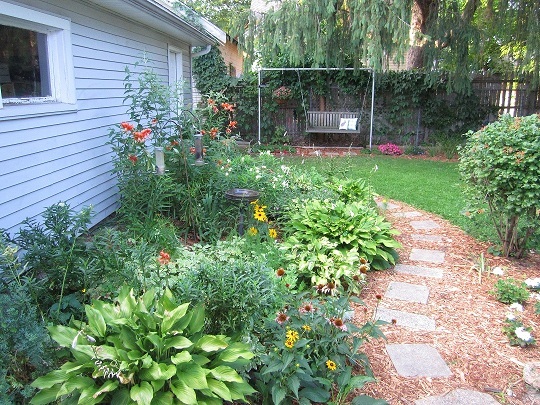 Lots of great plants that bloom in stages for great color from spring to fall! 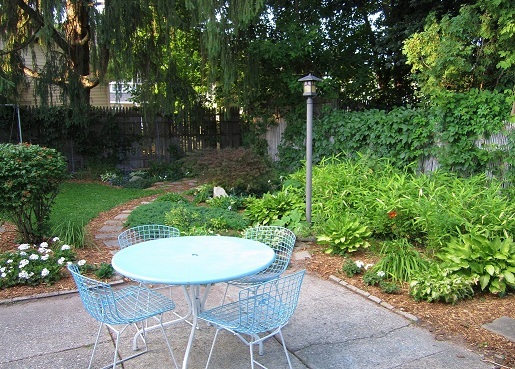 A great place to gather with a friend! My vintage patio set fits right in! Lots of lovely plants on this side of the garden. There's even a tiny pond hidden behind a giant hosta! In the very back of my yard I have a little swing to take in the view. 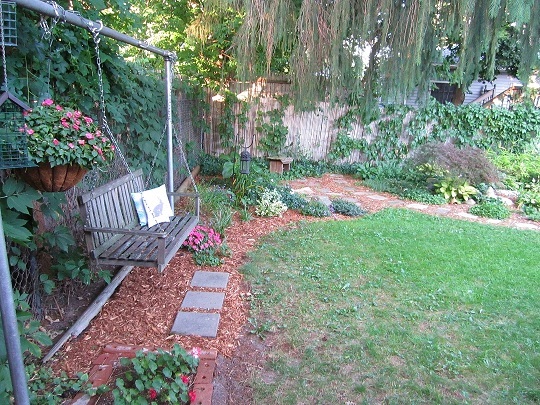 The moss garden is back this year and the very back garden has been expanded next to the swing. Last month I built a new veggie garden opposite of the other ones. 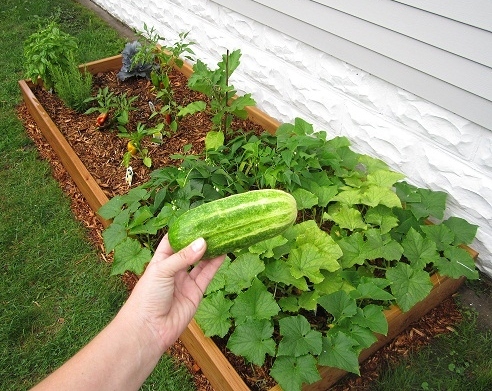 Check out my first cucumber! Looks like there will be lots this year! 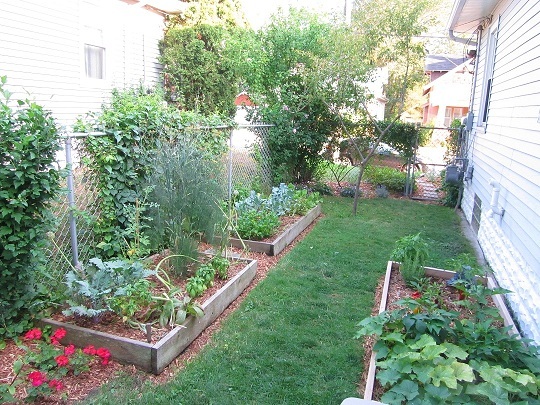 Also in this veggie patch: basil, oregano, cabbage, eggplant, green beans, and a few kinds of peppers. artgoodies featured on THE TODAY SHOW! SO exciting! artgoodies was featured on The Today Show today with Kathie Lee, Hoda, and Kathleen Daelemans! It’s amazing to be named one of the hottest housewares companies in the USA! Check out the video here! Here’s hoping that everyone has a safe and festive 4th of July and stays cool! I celebrated by heading to a flea market with a dear friend. I’ve already added some of my vintage treasure to my Vintagegoodies shop! Check out one of my favorite finds below! New old stock in the original box! 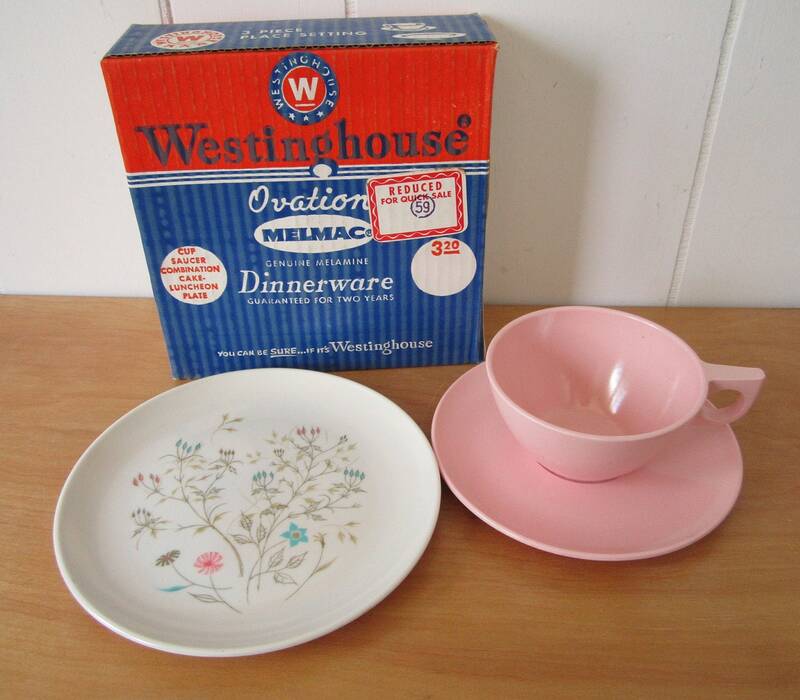 A darling luncheon set of vintage melmac AND I have 8 to offer you! It’s so fun to find brand spankity new vintage! Nothing says summer like some lake time which is where I headed for part of this weekend for a much needed day of rest! 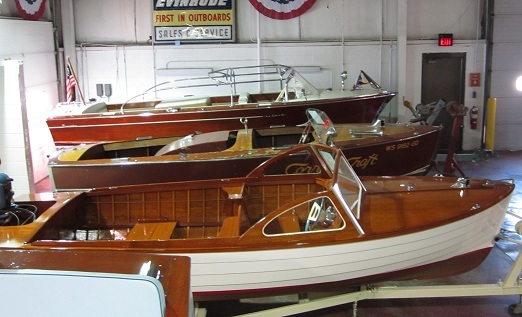 In the quaint town of Cassopolis, MI is the most fantastic museum of vintage boats and cars! The collection is simply amazing. Mahogany Outfitters Museum is located at 980 E. State St., Cassopolis, MI. Plus if you make the trip Monday nights they host cruise ins with free food and trophies for cool rides! They are really just getting started here with a restaurant in the works and a rumored antique store which of course I’m dying to know more about! Check out some of my museum faves below! This adorable little thing works! I'm actually pretty sure everything in this museum works which is pretty amazing. This is a super gem! 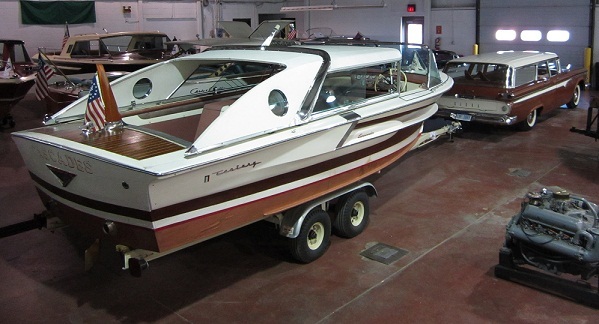 This boat and matching car, an Edsel, which is in itself a tough find, match! The pair is from 1959 with original factory finish. The boat, in 1959, cost $8900! Wowee, mega bucks for the 50s! 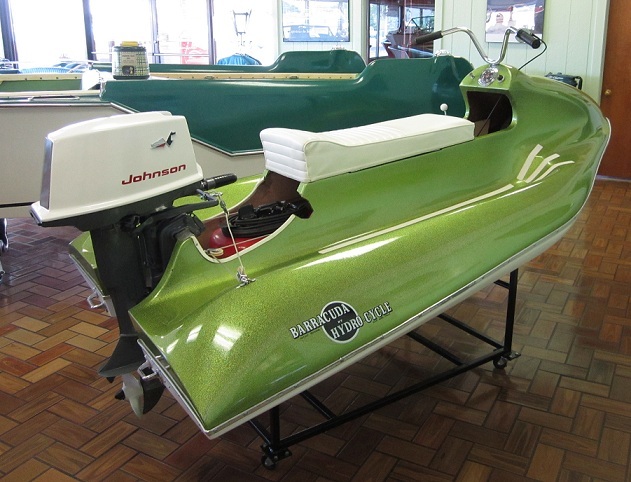 Check out the sparkly green finish on this amazing "jetski"! 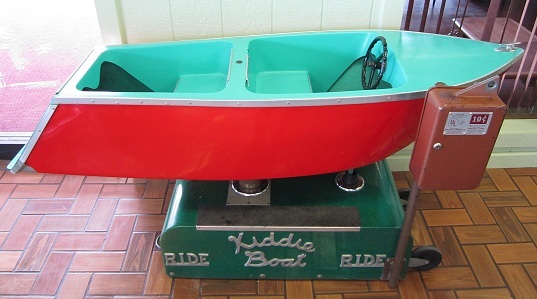 I'm pretty sure you need a super fantastic vintage swimsuit to ride this! Vintage wood boats are pretty awesome if you ask me. If you've never seen one up close the craftmanship will blow your mind. They are beauties in and out of the water with impeccable details!